The futuristic Mercury lamp was designed by Ross Lovegrove for Artemide in Italy. The Mercury lamp is a ceiling fixture that places a floating assembly of large pebbles below a simple modern aluminum disc. These in turn reflect each other, bouncing light between their taught bio-morphic surfaces and reflecting the environment around them. 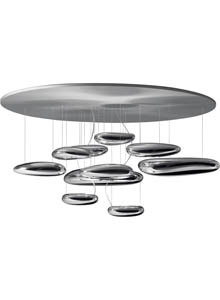 The reflective pebbles are made of molded thermoplastic with a polished chrome finish. The Pebbles contain the light source in a die-cast aluminum, polished chrome finish. The Mercury lamp further features a grey thermoplastic canopy with clear electrical cords and stainless steel cable. During the day, the Mercury lamp acts as a sculptural object reflecting the dynamics of natural light and movement of people around them. Best of all, the Mercury lamp is UL listed which makes it suitable for both residential- and commercial projects. Made by Artemide in Italy. A new icon of modern design. The drop length of the pebbles can be adjusted, as it comes with 6 feet of cables. Custom sizes available through Stardust upon request for larger quantities (any size of plate & any number of pebbles). Custom orders can not be canceled and will have a 12 weeks lead time. Winner of the reddot design award: best of the best.